Here is an opportunity to participate in making walkable and bikable communities a part of the larger conversation on progressive development. The list of panelists are brilliant! Your evening will be well spent. I hope to see you there. A Borrowed Blog -- Thanks BCGP! Along with first-timers Freedom Valley event planner Jill Minick, Philadelphia Advocacy Consultant Sarah Clark Stuart, Delco Chair David Bennett and Walk Bike Berks founder Michele Barrett, veterans Hans, Alex, Fuji's Pat Cunnane and Yours Truly attended the entire three-day National Bike Summit. Rep. Earl Blumenaur and House Transportation Chair James Oberstar led the Congressional charge with their uplifting speeches. No Floyd Landis, Linda Armstrong or Greg Lemond to wow the crowd but we got along with record attendance (500 participants). This year's summit focused on laying the groundwork for the 2009 Transportation Reauthorization Bill (GREENTEA?). Sarah Clark Stuart attended the Rails to Trails 2010 campaign for active transportation session. The most exciting component of the campaign is the expansion of the non-motorized pilot program which injects $25 million dollars per community to upgrade bicycle and pedestrian networks and shift towards bicycling and walking. Currently four cities are involved and RTC plans to push this for more than 50 communities. Two bills were introduced on Capitol Hill specific to bicycling before the Summit. In the Senate a Complete Streets Bill that will require Complete Streets Policies for all MPO's was introduced by Senator's Tom Harkin and Delaware's Tom Carper. Rep. Blumenaur has also put a resolution to the floor supporting the importance of bicycling. A Wheels For Wellness Bike Sharing Program was also announced at the AM Capitol Hill rally by Dan Beard, the Chief Administrative Officer of the U.S. House of Representatives. Alex, John and Sarah attended a big cities bike coalition meeting to discuss common goals among our peers in cities such as San Francisco, Portland, Chicago, Washington, DC Seattle and New York. Like BCGP, these organizations are well established and have respectable membership numbers. Discussion was preliminary but an urban bicycling agenda will be developed at conference in June of 2008. The BCGP mobilized an impressive team on Capitol Hill Day, with representatives from all of our Pennsylvania districts and three of our New Jersey Districts gave us better coverage than ever. We were armed with leave behind sheets from the National Summit as well as local issues, such as the East Coast Greenway and Ben Franklin Bridge. We will be following up with each representative over the next few weeks. Please consider joining us next year - it's the year of the transportation bill plus Washington DC's and Capitol Hill's Bike Sharing programs will be in full swing. Their mission is to build, maintain, and utilize Berks County's trail systems and green spaces for recreational purposes while increasing public awareness of environmental initiatives. They want to revitalize our ailing natural infrastruture and renew interest in outdoor living. While visiting the site, be sure to check out the Antietam Lake photo album. They worked hard on clearing the trail for others to appreciate. Encourage a friend, neighbor or family member to take the pledge by sending them a cool eCard, and help each other make short trips by walking or biking together. Use an online distance-measurement tool to calculate the distance from your house to nearby destinations. In 20 minutes, one can typically walk one mile or bike at least three miles. Nearly half the trips in America are three miles or less. If you already walk or bike occasionally, consider biking to a destination to which you would have previously driven. Ask a friend, co-worker or family member who already walks or bikes to work or school to help you get started or share their commute. Commit to being car-free on a specific day each week—and stick to it! Avoiding a weekly 20-mile car trip will keep about 1,000 pounds of greenhouse gases out of the atmosphere annually. Visit Rails-to-Trails Conservancy's online trail-finder, TrailLink.com, to find a trail near you. In many communities, trails link destinations, enabling activities such as errands, commutes or outings to be completed while enjoying a walk or bike ride on a trail. Walking and biking to mass transit may greatly increase the distance you can travel without an automobile. Most large cities in the United States provide online trip-planners for their public transit systems. By entering basic trip information, these online planners often provide specific route information, including cost. Google Transit , for instance, allows residents of select cities to search for transit trips. If you don't have a working bicycle, visit your local bike shop and explain your goal of biking as transportation. Shop staff can advise you about getting your old bike in working order or what it would take to get a new or used bike that meets your needs and fits your budget. They are interested in seeing more cyclists in the community and are happy to help you get started, easily and safely. Get tips on how to travel without a car by reading Chris Balish's How to Live Well Without Owning a Car or Katie Alvord's Divorce Your Car! If you have children, instead of shuttling them in a car, walk or ride with them to school (learn about Safe Routes to School) or to a nearby friend's house to play. You'll get to spend more time with your children and get in some exercise. Plus, you're creating a trend for being active that can last them a long, healthy lifetime. Become an advocate! Now that you've taken the Burn Calories, Not Carbon!™ pledge you can make your voice heard on important trail, walking and biking issues. You can also promote our 2010 Campaign for Active Transportation—which aims to double the federal investment in trails, walking and biking—to your political leaders. Please join us today so that we can come to your community. We are working with school districts and community governments to bring more than $6M in Safe Routes to School funding to Berks County communities. We want to make our streets safer for all users -- specifically for children in school zones. Together with PANA and PennDOT, we will make our streets safer for kids. Join us in that mission. Complete the following membership form and send in your donation today. Yes, I want to help make our region the best for walking and bicycling! Please enroll me as a member. *501(c)(3) nonprofit tax-exempt status is pending approval. Members receive invitations to special events, access to WalkBikeBerks listserves and e-mail action alerts! If you have any questions, please feel free to contact us at walkbikeberks@yahoo.com. We need your time, energy and talent. Volunteer Today! _____ Yes, I would like more information about volunteering with WalkBikeBerks. Get involved in Road Safety Week. Click here to find out how you can get involved in Road Safety Week in November and help raise life-saving road safety awareness among your pupils and in your local community, via http://www.roadsafetyweek.org.uk/. Click on 'Educators' for the online Road Safety Week Action Pack. This includes lesson ideas, information on working with your Local Authority to achieve safe routes to school, an order form for free posters and lots of free and low-cost resources for secondary school children that you can use to help teach road safety. You can also click on 'Information for kids and teenagers' in the left-hand menu of this website for advice and activities for 11-14 year-olds, 'Information for young drivers' for a section aimed at older pupils and 'The Facts' for information sheets on many road safety topics, such as cycle helmets, quad bikes and mini-motos and crash statistics. In October of every year, the international community participates in International Walk to School Day. To meet the needs of all users in a community, many have opened their Walk to School Event to make it a Walk, Bike, or Car Pool to School celebration. WalkBikeBerks will be working hard to encourage county-wide participation, so keep checking back with us for more information about how to register your school. Business and employess are invited to contact WalkBikeBerks to learn more about Bike To Work Day. The National Event will be held May 15, 2008. Let us know how we can make your Bike To Work Day even better. I strongly support your efforts in the Safe Routes to Schools and funding. I also support the Complete Street Bill (S#2686) as well as support the Congressional Resolution #305. By having a Safe Route to School and other public facilities it would benefit all individuals and promote a safe and clean environment for everyone. Working at City & County Polling locations for the November 6th Municipal Election (please see documents below) If you are interested, please email or call the Board of Elections at 610-478-6490. Senator Harkin (D-IA) introduced the Complete Streets Act of 2008 on March 3. Read more about the Senate bill and how to take action. Read the proposed legislation and follow the progress of this bill. A standing-room only briefing on the link between the built environment and public health, including complete streets. The energy bill that was recently signed by President Bush includes a "Sense of Congress" supporting 'complete streets,— basically representing a statement of support for the concept. Read more on Smart Growth America's blog. The supervisors also heard an update from WalkBikeBerks president Michele Barrett on the group's progress toward making Exeter a walk-able, bike-able community and on bringing the Safe Routes to School program to the township. Barrett said that Exeter Township GIS Administrator Eric Gardecki created a township sidewalk map that shows completed sidewalks and areas that have only a partial infrastructure. Barrett said she hopes to be able to overlay that map with a population density map and districting lines for each of the township's schools to determine where the group should focus on creating safe routes to schools that would benefit the largest number of children. Highway Superintendent Clarence Hamm did research to help the group prioritize the cost of various road projects. Hamm suggested some zero cost projects to the board including restriping of crosswalks to increase visibility as a traffic-calming measure and using free-standing crosswalk markers provided at not cost by the state Department of Transportation. Barrett also said Towship Zoning Office Cheryl Frankowiak, Police Chief Christopher Neidert and Parks and Recreation Superintendent Joe Seltzer were working with the non-profit group. On March 6, 2008 at 1:00, I had the pleasure of visiting with Congressman Gerlach in his office in Washington, DC. As you can see, he warmly welcomed us and took time to hear our concerns. 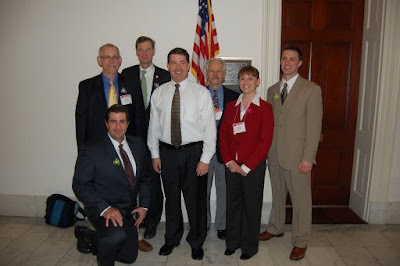 As participants of the National Bike Summit hosted by the League of American Bicyclists, we asked the Congressman to join the Congressional Bike Caucus and to Support H.Con.Res 305 -- The Complete Streets Bill introduced to the House on March 3, 2008. We hope that the Congressman agrees to sign on as a Co-Sponsor of the Bill. A partner Bill will go to the Senate as well. We also thanked the Congressman for continuing to support the Federal Safe Routes to School Program and invited him to begin traveling in his Congressional District over the next year to see SRTS at work in our communities. Each Summit participant also took time to express individual needs for their communities for Complete Streets projects that need the support of the Federal Government. At your earliest convenience, thank the Congressman and his staff for their time and attention to our concerns. Be a part of America's Best Professional Cycling Events! Geared Up to Volunteer? We always have room for helping hands and smiling faces! Whether you’re a die-hard cycling fan or just a fan of the outdoors, you are welcome to join us for one, two, or all three races. Show off your community pride and help us host a safe and memorable Race Day for everyone! Mountain biking enthusiasts from around the globe will gather in Park City, Utah, June 18-21 for the 2008 IMBA World Summit. IMBA Summits bring mountain biking advocates, land managers, ski resort professionals, trailbuilders, park and urban planners, tourism officials and the bike industry together for collaboration, planning, and celebration. The Summit will be based at the Park City Marriott. We'll have lots of opportunities for outdoor workshops, guided networking rides, and other field sessions so you can embrace all that Park City has to offer. I have spent two days learning and networking with the leaders in the bicycle world. Industry, businessmen and woman, advocates and lobbyists, and true kindred spirits surround me in this great city filled with the American can-do spirit. Tomorrow morning I will speak to Congressman Gerlach, Senator Casey, and Senator Spector. I will also take a moment to see Congressman Platts. Your letters to these men as well as to local policy makers, school boards, and to the editors of our local newspapers help me gain support and moment for the excellent mission of WalkBikeBerks. If you have not yet done so, please write your personal story about what WalkBikeBerks means to you. Explain in simple, real life situations how our quality of life improves when we have choice of transportation, when our streets are designed for people first, and when we no longer depend on cars to take us to the park or to our public library. Thank you for the fine work you are doing for the communities of Berks County. I'll see you soon. 5K Race and Fun Run/Walk. Schlegel Park. Please share with us all Hiking, Biking, Running, and Walking events that are taking place in Berks County this year, and we will be happy to advertise them on our blog and in our membership newsletter. Washington, D.C. — Senator Tom Harkin (D-IA) today introduced The Complete Streets Act of 2008, which would work to promote the design of streets that are safe for all of those using the street— including motorists, bus riders, bicyclists, and pedestrians, including people with disabilities. Between 1993 and 2003, nearly 52,000 pedestrians and more than 7,400 bicyclists were killed in road accidents; studies show that the designing streets with pedestrians in mind may reduce pedestrian risk by as much as 28 percent. Harkin was joined in this effort by Senator Tom Carper (D-DE). A recent study by the Texas Transportation Institute found that providing more travel options, including public transportation, bicycling and walking facilities, is an important element in reducing traffic congestion. The study reported that congestion was responsible for an annual $78.2 billion loss in fuel during traffic jams in 2005, an increase from $57.6 billion in 2000. Also, as recently as 30 years ago, up to 70 percent of children were walking or riding bikes to school. Currently, the number has dropped to only 10 percent. Parents report that traffic safety is the main reason they do not permit their children to walk or bike to school. This legislation will make our environment more inviting for physical activity, especially for kids. Harkin’s proposal has been endorsed by: AARP, America Bikes, America Walks, American Council of the Blind, American Planning Association, American Public Transportation Association, American Society of Landscape Architects, Association of Pedestrian and Bicycle Professionals, League of America Bicyclists, National Center for Bicycling and Walking, Safe Routes to School National Partnership, Smart Growth America, Surface Transportation Policy Partnership, Thunderhead Alliance, and Rails to Trails Conservancy. Please take a moment to review the Board of Directors List to the left. With deep regret, we had to accept the resignation of Claire Young from the Board. She was an excellent Events Coordinator and worked hard to generate a list of Events for 2008 that I'm sure you will all be excited about. Keep watching for updates. We are thrilled to welcome David Sloyer to the Board to fill the new vacancy. David comes to us with so much to offer. He leads the Reading Trail Blazers, works at Spokes Bike Shop, and is committed to our cause. His energy, passion, and expertise will serve WalkBikeBerks well. When you have a chance, tell him welcome. In addition, we are thrilled to announce we have a new secretary: Barbara Rowley. We will work with Barbara to help her feel welcome, but I have a good feeling that she will fit right in. She comes to us with secretarial experience and has already jumped right in. In her first meeting with WalkBikeBerks, she recorded minutes and is working on preparing those for us now. Thank you Barbara, and welcome! Again, the most amazing people attended our meeting. Some new faces mixed with some familiar ones. I am always so impressed with the knowledge and experience that our growing membership brings to WalkBikeBerks. Today, we were able to begin our strategies for the year with our focus on county-wide Event Planning, a Safe Routes To School Campaign, and our Membership Drive. Details will soon be posted and advertised throughout the county, so keep visiting to learn more. Community Calendar at http://www.readingeagle.com/calendar.aspx. We will also work to advertise regularly with WEEU and BCTV. Make sure to call others to encourage them to attend a meeting and to learn more about WalkBikeBerks. The Last Saturday of Every Month -- Beginning March 29, 2008. These will be breakfast sessions with coffee and light refreshments.